79 Piece compact and portable Art Set to take with you anywhere for hours of satisfying and creative fun. All the art supplies a Beginner or Intermediate artist needs to create their own art. Unlike other Art Sets, the mediums are high quality to make sure you won't be disappointed. Includes: 24 color pencils, 24 oil pastels, 24 watercolor cakes, 2 paint brushes, 2 drawing pencils ,1 pencil sharpener, 1 sanding block and 1 kneaded eraser accessories. Conforms to ASTM D4236. Non-toxic. Contains small parts, NOT for children under 3 years! 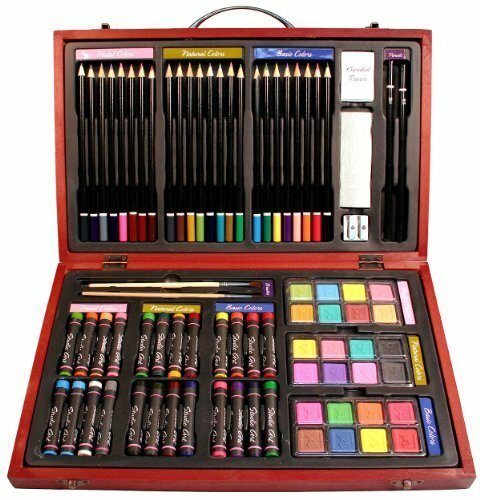 79 piece deluxe art set including art supplies for drawing, painting and more! If you have any questions about this product by Nicole, contact us by completing and submitting the form below. If you are looking for a specif part number, please include it with your message. Coloring-On-The-Go Adult Coloring Books – 74 Mandala Coloring Pages W/Durable Designed Pouch & Hardcover Spiral Bound Format- High-End Portable Adult DIY Craft Creative Kit -Be Creative Everywhere!